Back by popular demand! Come see a polka band with attitude. 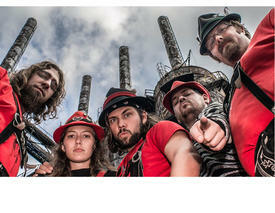 The Chardon Polka Band breathes new life into the polka genre with their offbeat antics and one-of-kind style. Performing polka favorites with new energy and excitement, this is a great concert for polka aficionados and non-polka-fans alike. The Chardon Polka Band plays traditional polkas, but sometimes morphs into punk-rock renditions of the same songs. The band’s range of style is as eccentric as its members. This free program is cosponsored by the Stow-Munroe Falls Public Library and the Friends of the Library. Register for this program online.